This fun tandem paragliding adventure takes you soaring into the skies, from where you'll get stunning views of the coastline and the gorgeous ocean stretching into the horizon. This is an easy adventure that is suitable for first-timers, and does not take too long. 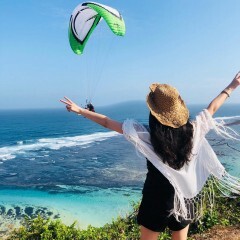 You'll be picked up from your location in Sanur, Seminyak, Nusa Dua, Legian, Jimbaran, and Kuta, and taken to the paragliding point in Timbis. You'll have a short briefing session, and then will be strapped into your gear. An experienced instructor will accompany you, and will control everything. All you have to do is sit back and enjoy the ride. You'll be dropped off back to your hotel when it's done. NOTE: This tandem paragliding flight is up to 20 minutes, but is completely wind-dependent. You'll cover about 12 kms, and will go to a height up to 500-1000 feet above sea level if the weather permits. IMPORTANT: A minimum of 2 persons is required to make this booking. You will be picked up and taken to Timbis Beach, on the south coast of Bali. There are cliffs here from where the Bali tandem paragliding flights take place, and you'll get great views in all directions. The cliffs are white, and form a dramatic contrast against the blue ocean. The winds at Timbis Beach are perfect for Bali tandem paragliding between May to October, when the skies are clear and the days are warm. You'll be flying in the afternoon and will be able to see far into the distance. 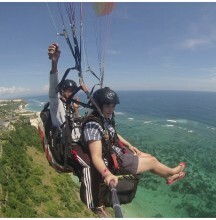 • Sign up for an easy, thrilling tandem paragliding flight in Bali. • Do a tandem flight up to 20 minutes, without needing to know anything about paragliding. 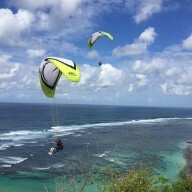 • Enjoy a relaxed day with complimentary pick-up and drop (limited locations) for your Bali paragliding flight. 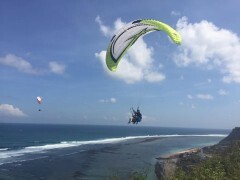 • Soar to 500-1000 feet above sea level, over the white cliffs and blue ocean at Timbis Beach, Bali. • Book an offbeat adventure activity that can be conveniently fitted into your Bali sightseeing schedule. IMPORTANT: Prices are subject to some fluctuation depending on the exchange rate. You cannot fly if you are over the age of 65, or if you have any health conditions. The operator will not allow you to fly if you are under the influence of alcohol or drugs, or are unwell, or unfit in any way to fly. There will be no refunds in this case. Please make sure you are waiting for the pick-up at the appointed time. There are no refunds if the customer cancels the booking, or does not show up, for any reason. If the weather is bad or not suitable for flying, the customer may reschedule the flight for the next day. There will be no refunds. All paragliding activities are dependent on the weather. The operator will call or SMS you on the day of your flight to confirm timing and to discuss your pick-up location. 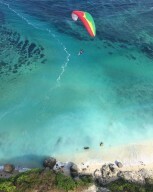 There is an extra cost of USD 25 if you want photographs/videos of your paragliding flight in Bali. You will be given a micro-SD card at the end of the flight if you choose this. Bali tandem paragliding flight day! You will be picked up from your hotel and taken to the flying point. Here you will receive a short briefing from the team, and then you'll get ready for your tandem flight. Your instructor will be flying with you, so you don't have to do anything. When your flight is over, you'll be dropped off at your hotel again. Your Bali tandem paragliding trip ends here. You'll be picked up from your location in Kuta, Legian, Sanur, Seminyak, Nusa Dua and Jimbaran. The operator will let you know what time you will be picked up, depending on the flying time for the day, and on your location. Do inform the operator of your hotel address once your booking is confirmed. 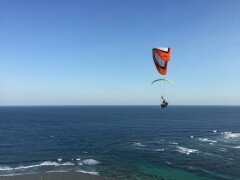 The operator will arrange your transport to and from the start point of this Bali paragliding trip.